To make the dressing, place the oil, vinegar, pomegranate molasses and lemon juice in a bowl, whisk to combine and set aside. Preheat oven to 170°C (340°F). Place the eggplant, cut-side up, on a baking tray lined with non-stick baking paper. 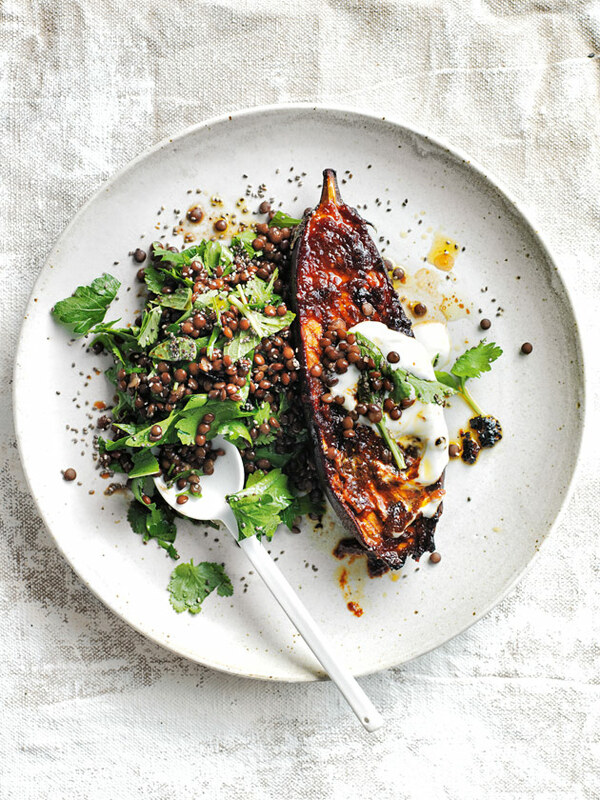 Place the harissa, garlic, pomegranate molasses and lemon rind in a bowl and mix to combine. Spoon over the eggplant, drizzle with oil and roast for 1 hour or until tender. Place the lentils and water in a small saucepan over high heat and bring to the boil. Reduce the heat to medium, cover with a tight-fitting lid and simmer for 20 minutes or until just tender. Drain and refresh under cold running water. Place the lentils, parsley, coriander, mint and chia seeds in a large bowl. Top with the dressing and toss to combine. Divide the eggplant between serving plates and spoon over the salad. Top with yoghurt to serve. Serves 6.